I am saddened by the disastrous financial crisis in 2008 which caused a lot of wealth destruction. It is a wake-up call, not only for Wall Street but also the regulators who have been sleeping on the job. Nobody seems capable of solving the recession for us. Interest rates have been cut and bailout and loans in billions of dollars have been doled out already. Yet, we are nowhere near the bottom of the market. In fact, I have enough of the saying: "Things will get worse before it gets better." If politicians and economists earn their stripe and money (and they look recession-proof) by reciting this phrase over and over again, I will consider switching jobs soon. My wife has been discussing with me whether saving our money has been worth it. The upside of making huge amount of money is limited but we share in the downside when the market collapsed. Our philosophy has always been prudence with our income and an abhorrence of loans. However, the reckless manner in which the government heaped debts on taxpayers when they bailout financial institutions and propped the housing market is shocking. The trillions of dollars will come back to haunt us in the form of future taxes. 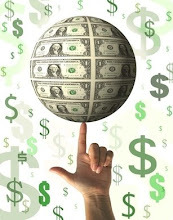 It is ironic that we get creative about pinching our pennies but end up forking huge wads of cash to save those who practice irresponsible lending and borrowing. In any case, since we will be having more of the bear market in 2009, let's keep our spirits up by seeking positives from a negative situation. 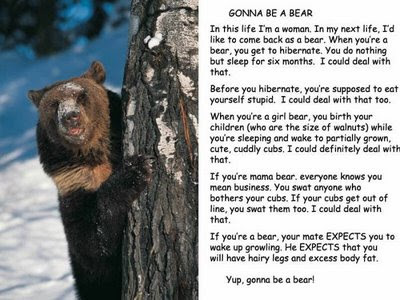 My wife loves the bear poster below and looking at the advantages of being a bear, I can't help but agree. Check it out!